A hands-on approach to conservation from those working in forest lands that don’t get the attention they deserve. It has often been said that India has amongst the world’s best wildlife protection laws (under the Wildlife Protection Act of 1972) and it is laudable that we still have so many heavyweight denizens, from apex carnivores to five-tonne herbivores surviving in our jungles — many of them albeit very precariously. This, in the face of us being one hell of a complicated country, where lifestyles, cultures, languages, food, and everything to do with living, radically changes every 10 km or so. Bringing such a diversity of life under one set of laws is difficult enough — and implementation is altogether another matter. And it’s not necessarily because of any mala fide intent (though in some cases it most certainly is) that often things don’t work out. It’s just because that’s how life is, particularly for those who have been living and continue to live cheek by jowl with our wildlife, and whose livelihoods and very survival may depend on them — all this in the face of ambitious development projects which, all too often, come in direct conflict with environmental issues. The nine essays in this book by social scientists who have spent considerable time ‘in the field’ illustrate this. The areas looked into include the fishing community, tribal hunting (especially in the North-East), the impact of Naxals making use of protected areas and that of marginalisation and militancy, the wildlife trade, and our shortsighted attitude towards grasslands. Nearly every essay begins with someone’s personal story — how lives have been affected by say, new laws, changing customs and even differing personal points of view. One fisherman may say that fishing is the only life he knows and is what his children will continue to do, another says he’d rather have his next generation educated and get jobs which have nothing to do with fishing. What’s good for some may be disastrous for others. Thankfully, there’s no gushing over the ‘noble savage’ syndrome, which is so often a favoured theme of (especially) city-bred environmentalists. But yes, where there are people and animals and nature interacting — there are complexities, complications and problems galore. 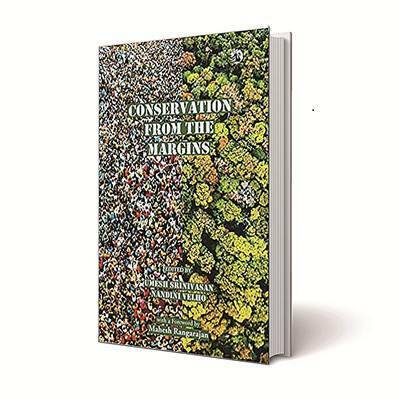 The essays cover almost the entire geographic range of India — from our offshore oceans, mangrove swamps, the forests of Palamau, the Himalayas, and, of course, the North-East, which still hasn’t been studied nearly enough, given its teeming biodiversity. What emerges is how difficult it is to govern a nation such as ours where there is such a diversity of lifestyles and where too often those on the sidelines — the “margins” mentioned in the title of the book — get ridden roughshod over time and again. Against this, there are also stories of those diligent, stubborn and courageous officers who have dared and succeeded to make a positive change in the face of almost impossible odds. For those wanting to make a career in this line of work, this book may seem a bit of a downer — the problems seem just too many and too intractable. Do you really want to put your foot into what seems to be a snakepit? But problems can be and have been solved, and there are people out there working indefatigably to make things work. So far in India, attention has been paid (by the media, people and lawmakers) mainly to the charismatic and the glamorous. This book shines a light on those left in the shadows — who are, probably, far more important when it comes to protecting our wild heritage — than the rest of us who see most of our wildlife on television. All the essays are well-written, comprehensively sourced, and, thankfully, free of the jargon social (and other) scientists are usually so fond of using. A must-read for those who want a peek into what really is going on out there in what’s left of the wild places of our country.